Behind the Mic—Guest Jonathan Horowitz – Welcome to the 2019 Beemie Awards! 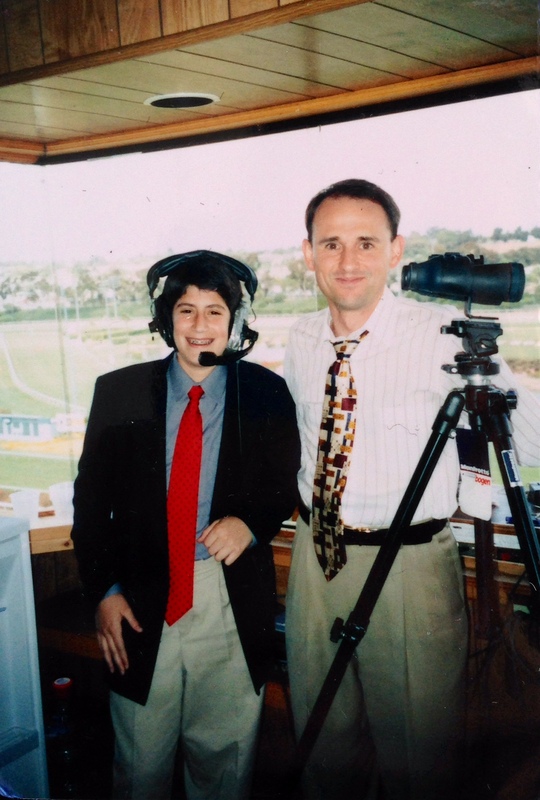 Jonathan Horowitz was calling races at big national and international tracks like Santa Anita, Hollywood Park, Lone Star Park, Gulfstream, Goodwood and many others at the young age of 14. After going to college at USC and pursuing graduate work at the University of Maryland, Jonathan has returned to announcing as the full-time racecaller at both Zia Park in New Mexico and Arapahoe Park in Colorado. JH: Going to the racetrack was a Horowitz family activity for both my father and his father and then for my parents, brother, and me. I was fascinated by how the announcer was part of the live experience at the racetrack by giving a running commentary as the race was unfolding. There’s no way to rehearse what to say ahead of time like an actor or actress. So I used to bring binoculars and a tape recorder to the racetrack and see if I could commentate the race. And I discovered my passion. You had the unique experience of getting to call races at the track when you were just a kid. How’d that all come about and tell us about getting to call races at some big tracks before you were even allowed to drive a car! JH: My first race call was at Los Alamitos Race Course in October 1999 when I was 14 years old, and I became the youngest person ever to announce a horse race in the United States. About five months before, the Los Alamitos management had first noticed me practicing announcing with my family in the Vessels Club. I thought they were going to tell me that I was disturbing people. Instead they were inquisitive about such a young person who wanted to announce. I met owner Ed Allred, general manager Rick Henson, announcer Ed Burgart, publicity director Orlando Gutierrez, and guest relations head Julie Farr, and I am so grateful for their giving me my start. They asked if I would like to announce the American Quarter Horse Youth Association Stakes for horses owned by kids who were 18 and under on Challenge Championship Night. Having a young announcer fit with their goal of getting youth involved in horse racing. What I remember most about that first race is that the headphones were too big for my head and fell off in the middle of the race. I still see the image of my catching the headphones out of midair and finishing the call. After going to college you took the helm at Arapahoe Park. Tell us about that track and your first announcing job! JH: I was in the final semester of my master’s degree program at the University of Maryland and accepted the job at Arapahoe Park on my birthday, March 30, 2011. I could not have asked for a better first full-time race calling position than Arapahoe Park. The feeling among everyone—from the fans to the horsemen to the management—is like a family. The racetrack is expanding, and I take tremendous pride in being part of a growing racetrack through my announcing, writing articles about the races, teaching “Wagering Do’s and Donut’s” classes, and starting our social media presence. Last year Chips All In became the first horse that has ever raced in Colorado to compete in the Breeders’ Cup. You’re also the announcer at Zia Park in Hobbs, NM. Is there actually anything to do in Hobbs other than go to the track? JH: One of the most rewarding benefits of being an announcer is getting to travel and live in parts of the United States that I never thought I would visit. The area around Hobbs has some attractions that I think epitomize Americana. There’s the Buddy Holly Center in Lubbock, Texas about the rock-n-roll pioneer who created a sound that subsequently influenced The Beatles, Bob Dylan, and so many others. Carlsbad Caverns shows the beauty that can sprout in the Southwest deserts. Hobbs is a growing city with some of the friendliest families I’ve ever met. You have a few months off in the wintertime, what do you do when not announcing horse races? JH: For the past three years I worked at the Library of Congress Publishing Office in Washington, D.C. I wrote a book with Susan Reyburn and Athena Angelos titled Football Nation about 400 years of history of football in American life that was published last October. I have also authored a set of sports trivia cards titled The One and Only and contributed to the publication of books about presidential campaign posters and Hebraica at the Library. I love the idea of being creative through both my writing and my announcing. 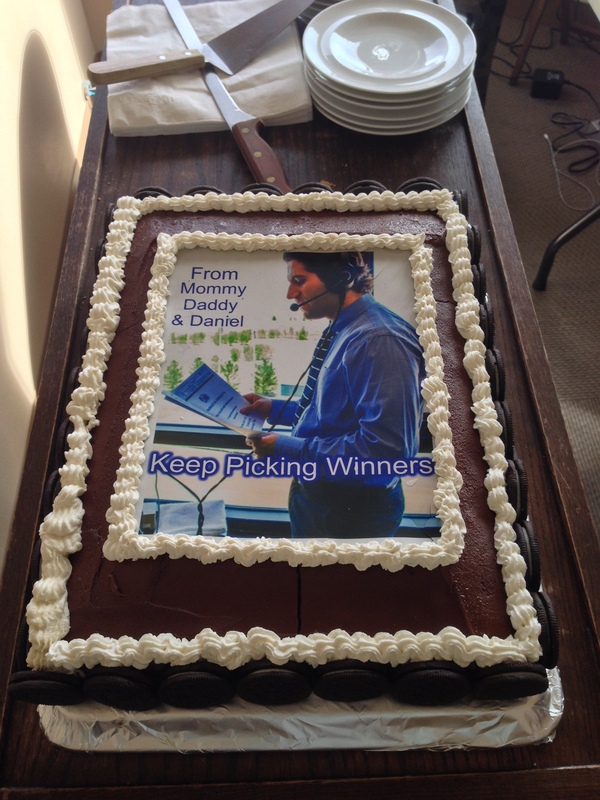 Are you a handicapper and bettor? If so, what are some of your most memorable scores at the windows? JH: In general I don’t bet on horse races. However I do have to handicap the races and give my top-three picks on camera for each race at Zia and Arapahoe when the horses are in the paddock. I want to see my picks do well, especially when I have family, friends, and fans following them. Most of us have one memory or another about the great Luke Kruytbosch, what do you remember about him? JH: I still have the program Luke Kruytbosch autographed for me when I first met him on November 27, 1998, when I was 13 years old. Looking back, that first meeting set off a tremendous chain reaction. Here was one of the best announcers of his generation encouraging me to pursue my passion at a young age. The way he selflessly welcomed my family and me into his booth was the impetus for me to contact other announcers and give this my all, and within a year I called my first race over a public address system. I guess we never really know how tremendous an impact a smile and a friendly face can have on the world. In 2014 you have a “Call Any Race You Want” card, which race would you cash it in to call? JH: The race right after the Kentucky Derby. As a Southern California native, what were your best memories of Hollywood Park? JH: The Hollywood Park press box is where I learned to announce. Hollywood announcers Michael Wrona and Vic Stauffer also became friends and mentors for me at a very young age. I could not have asked for a better boost in confidence than having two top announcers at one of the best racetracks in the country open their doors to me. My favorite part of Hollywood Park was being really quiet in the announcer’s booth and imagining all the racing legends that ran there and the distinct raspy voice of legendary announcer Harry Henson when the booth shook in the wind. If I’m in Denver at Arapahoe and the races are done, where are you sending me to get a great meal for dinner? Same question with Hobbs! JH: In Denver, Eastside Kosher Deli, and mention my name. In Hobbs, our Centennial Steakhouse at Zia Park. Patrick Leckrone, the director of food and beverage, and Mark Cowgill, the executive chef, put together a tasty new menu last year. And I would be happy to invite anyone who visits me in Denver or Hobbs over for a home-cooked meal. This entry was tagged announcer, arapahoe park, horse racing, Jonathan Horowitz, zia park. Bookmark the permalink.